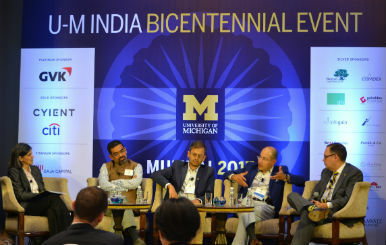 New Delhi: The University of Michigan India Alumni Association (UMIAA) organized its annual event in Mumbai, India. The event was attended by more than 250 alumni from across India. 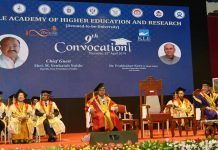 Eminent industry speakers including Chanda Kochhar, Managing Director & CEO of ICICI Bank Limited, ScottDeRue, Dean of The University of Michigan’s Stephen M. Ross School of Business Affairs and BVR Mohan Reddy, Founder and Executive Chairman, Cyient and Ex-Chairman of NASSCOM attended the event. Mr. Eddie Chandhok, President Global Delivery Organization, Infogain and an alumni of The University of Michigan participated in a panel discussion on “What do rapid advances such as robotics and automation technology mean for economy, politics, and society in India?” The other participants included Andrew Martin, Dean of the University of Michigan’s College of Literature, Science, and the Arts, Ananth Narayanan, CEO of Myntra and Jabong, Vishal Mehta, Co-founder & managing director at Lok Capital. The discussion was moderated by Farina Mir, Professor and Director of the University of Michigan’s Center for South Asia Studies. The panel discussed the importance of skills development, creation of new types of jobs, and the importance of investing time in learning skill acquisition throughout employees’ careers in the digital era. The speakers highlighted how universities need to adapt in the digital era, including formal approaches to ensure students are equipped to make decisions and evaluate the values and ethics implications of decisions being made in business and society.